The Wichita police officer who killed Andrew Finch on Dec. 28 didn't see a gun in Finch's hand, he said on Tuesday. Justin Rapp testified about what happened when he and his partner received information from dispatch that there was a man who had shot his father in the head and was holding his mother and sibling hostage inside a home around 6 p.m. that night. But the hearing wasn't for Rapp - whose name hadn't been publicly released by authorities until his court appearance. 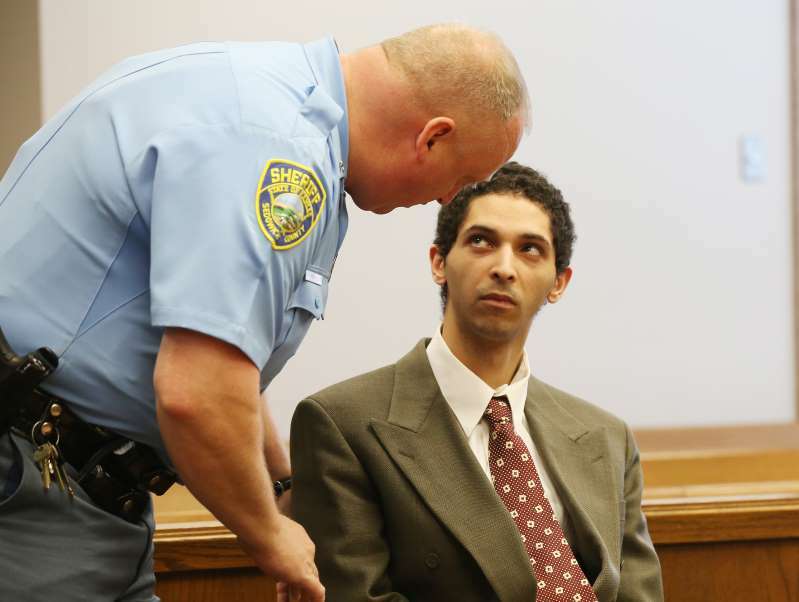 The hearing was for Tyler Barriss, the 25-year-old Los Angeles man who allegedly made the false - or "swatting" - call that resulted in Wichita police going to Finch's in the first place. When Wichita police surrounded the house, Finch's mother, Lisa, told The Wichita Eagle that Finch, a 28-year-old father of two, was curious about why police were outside and opened the front door. Body camera footage worn by some officers shows several of them yelling commands at Finch to raise his hands. Rapp said when he got to the scene, he grabbed his rifle and was directed by a sergeant to stand across from Finch's house to cover other nearby officers. District Attorney Marc Bennett asked Rapp what he thought had happened inside the house. "I believed the male caller had shot his father in the head and he had additional people in the house at gunpoint," Rapp said. He never thought the 911 call could have been fake, he said. "I have to believe the information I'm given until I can prove otherwise," he said. Several other officers were already positioned around the house when Rapp and his partner got there. Rapp said several times that no other information about the call was relayed to him beyond the initial dispatch. Information that the caller said Finch's two-story house was a one-story house apparently never made it back to officers on scene, and Wichita police didn't learn until after the shooting that the call was false. When Finch opened his door, a hostage negotiator wasn't on scene. Neither was WPD's SWAT team, Rapp said. Rapp said Finch - who he believed was the shooter - wasn't complying with officers' commands to put his hands up. "He very briefly put his hands up to approximately ear level and just as quickly put them back down to his waistband level," Rapp said. "He made a gun drawing motion with his right hand in the area of his right hip." To further explain, Rapp said it appeared as if Finch was drawing a gun from his waistband, or a holster. He turned his body, and "squares up" to the officers on the east side of the house, Rapp said of Finch. "My concern was that he was going to open fire on officers to the east side of the residence," he said. "I fired one shot and struck that individual." Asked by defense attorney Bradley Sylvester why Rapp believed Finch was the shooter, Rapp said "based on his actions." "Not complying and he makes motions consistent with drawing a firearm from the waistband," Rapp said. Later, Sylvester asked if Rapp saw anything in Finch's hand. According to a report released in April by Bennett, Rapp initially told investigators after the shooting that he believed he saw a gun. "At the same time that his hand starts to come up and that when I'm like OK he's, he's gonna fire at officers. I believe that I see a, a gun in his hand and as the, that's being raised at the officers and at that point that's when I decide to protect those officers and their lives and safety, I fire one round at this individual," he said in December. Charges against Rapp won't be filed, Bennett announced in April. Tyler Barriss doesn't have a cellphone that's connected to service. At least he didn't on Dec. 28 when two gamers - including one in Wichita - apparently asked him to "swat" another gamer. None of them involved were Andrew Finch. "Swatting" is the term used when someone makes a call to a police department with a false story of an ongoing crime - often involving killing or hostages - in an attempt to draw a large number of police officers to an address. So when Barriss allegedly agreed to make the call, he went to a library in South Los Angeles and connected to their Wi-Fi, making his smartphone usable. Los Angeles police Detective Edward Dorroh testified Tuesday about the interview he conducted with Barriss the day after the fatal swatting call was made. He said Barriss would claim that connecting to the library's Wi-Fi was his mistake in getting caught. Barriss had apparently tried using a VPN so it would appear that his IP address was coming from out of the country. But his first call to Wichita's 911 didn't work, Dorroh said. The second didn't work well either. So on the third try, Dorroh said Barriss didn't go through a VPN. He was traceable back to the library at that point, the detective said. But before Barriss was even handcuffed and placed in the LAPD's 77th Street Jail, detectives there were talking to detectives in Wichita, trying to put the pieces together. Dorroh was called by an officer in Georgia who had heard about the Wichita call and thought it sounded familiar. So Dorroh - who arrested Barriss in 2015 for making a bomb threat to a Glendale, Calif., TV station - called Wichita investigators. He listened to the 911 call and immediately knew it was Barriss, he said. They connected him to the library and arrested him there, he said. During an interview with Dorroh and another investigator, Barriss, "made some admissions" about having knowledge of what happened in Wichita. "To cut to the chase, he confessed," Dorroh said Tuesday. "It was straightforward." Two Wichita police investigators who testified before Dorroh said they had never heard of swatting before Dec. 28. But in Los Angeles, Dorroh investigates roughly 25 swatting calls a year and he gives swatting training to departments across the country focused on how to investigate the crimes. So he knew Barriss' deal, he said. And he knew Barriss personally. Investigators in Los Angeles have even assembled different recordings from across the country identifying Barriss' voice from other bomb threat and swatting calls, Dorroh said. He's wanted in Florida and Canada. Barriss told The Eagle that people would pay him to make swatting calls. He declined to tell the paper how much he would make. Dorroh asked the 25-year-old if he knew that making swatting calls could get someone injured or killed. "He claimed to have calculated the risks," Dorroh said. Reading from a script of the interview, Dorroh said Barriss responded, "I did know that, yeah. I'm not gonna deny that. I did know. It's just the fact that the worst possible outcome happened is so unfortunate." After the two-hour hearing, Judge Bruce Brown said there was enough evidence to bound Barriss' case to district court. He's scheduled for an arraignment in late June.